Masses of uranium fission fragments have been measured with the FRagment Separator (FRS) combined with the Experimental Storage Ring (ESR) at GSI. A 410-415 MeV/u 238U projectile beam was fast extracted from the synchrotron SIS-18 with an average intensity of 109/spill. The projectiles were focused on a 1g/cm2 beryllium target at the entrance of the FRS to create neutron-rich isotopes via abrasion-fission. The fission fragments were spatially separated with the FRS and injected into the isochronous storage ring ESR for fast mass measurements without applying cooling. The Isochronous Mass Spectrometry (IMS) was performed under two different experimental conditions, with and without B \(\rho\)-tagging at the high-resolution dispersive central focal plane of the FRS. The evaluation has been done for the combined data sets from both experiments with a new method of data analysis. 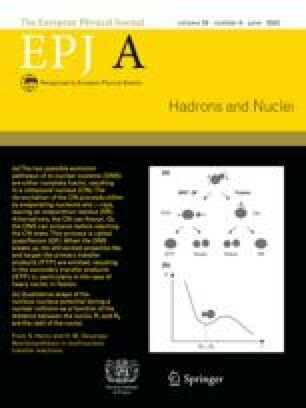 The use of a correlation matrix has provided experimental mass values for 23 different neutron-rich isotopes for the first time and 6 masses with improved values. The new masses were obtained for nuclides in the element range from Se to Ce. The applied analysis has given access even to rare isotopes detected with an intensity of a few atoms per week. The novel data analysis and systematic error determination are described and the results are compared with extrapolations of experimental values and theoretical models. Part of the author’s Doctoral Thesis (Justus-Liebig-Universität Gießen, 2015) contributed to this work.